Interior Design Story: Hello, baroque! This dinning room is for lovers of luxury. It's in baroque style that now seems to be forgotten. But this room, that can be called "moderate barogue", can actually fit nicely into the interior of your modern home. Overall, this dinning room looks gorgeous, isn't it? 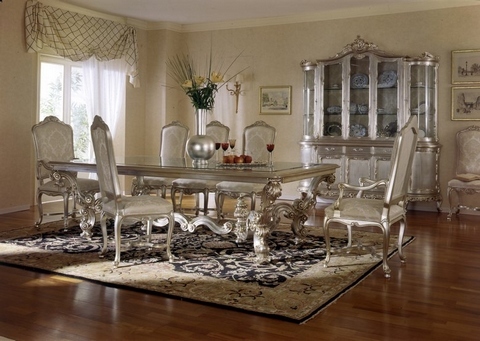 Yes the dinning furniture looks very reflective of baroque/roccoco , however the room itself fails to complete the picture due to not having any decorative elements which are the integral part of this style . ie. needs wall painting complemented by intricate gilding on the walls and the ceiling also a chandalier would be very nice too. i like the baroque modern style more than the traditional style .